World Health Day is global health awareness day held to mark the founding of the World Health Organization. World Health Day is one of eight official global health campaigns marked by WHO, along with World Tuberculosis Day, World Immunization Week, World Malaria Day, World No Tobacco Day, World AIDS Day, World Blood Donor Day, and World Hepatitis Day. When is World Health Day Celebrated? April 7th. Same day every year. Today is a good day to take some extra steps to care for your own health. Make better food choices, consider joining a gym or starting a walking club, or start taking multi-vitamins! You can help spread the word about the importance of good health and the threats to it on your social media platforms. You can use it to organize fund-raisers to support local free clinics and other public health sources or enlist the help of your employer to get involved. Blood banks as well are often taking volunteers to help out with their efforts. Since having healthy, fresh blood on hand is central to saving many lives, donate some of your own and bring a friend. 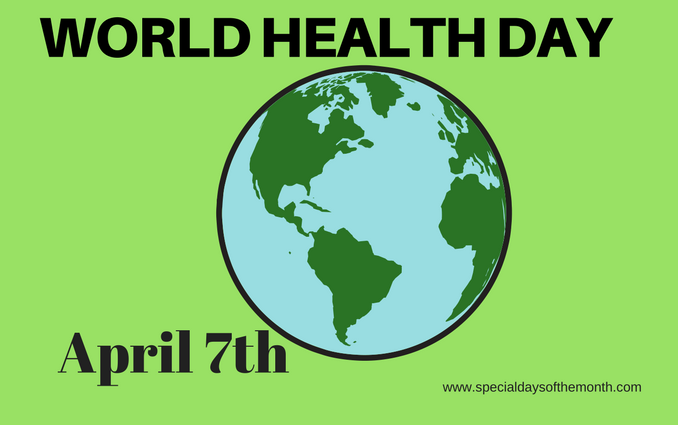 Each year the World Health Day focuses on specific themes such as health care providers, investing in health programs, promoting healthy cities and bringing attention to such health issues as depression, diabetes, high blood pressure, etc. World Health Day was established in 1950.
WHO lead the movement to eradicate smallpox in 1958.